Assault with a deadly swerve? Frustration with fellow motorists can lead to some poor driving decisions, but according to a San Luis Obispo Sheriff’s deputy and the district attorney’s office, one driver’s aggressive lane change was much worse than reckless driving. They’ve accused Eric Dukes with felony assault with a deadly weapon: his truck. If the charge sticks, Dukes faces two to four years in prison, a possible $10,000 fine, and a lifetime ban from getting behind the wheel. 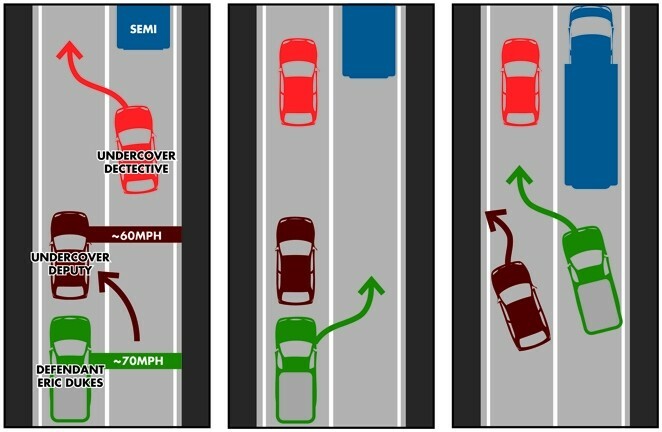 HIGH SPEED HOPSCOTCH : In order to prevent a suspect from noticing he or she was being followed, an undercover deputy of the San Luis Obispo Sheriff’s Department slowed traffic in the fast lane of Highway 101 on Feb. 14, allowing his partner to pass a semitrailer and maintain surveillance. When motorist Eric Dukes tried to do the same, the gap had narrowed between the deputy and the semitrailer, resulting in a near collision. The deputy admitted in court on March 6 that he could have yielded to Dukes, but he said he did not recall speeding up to close the gap. Dukes was arrested and charged with felony assault with a deadly weapon. On Feb. 14, Dukes was driving his F-150 pick-up truck northbound on Highway 101 near Templeton, traveling in the fast lane at a speed of roughly 65 to 70 miles per hour. A few car lengths ahead of him, a big rig was going about the same speed in the slow lane. Suddenly, a sedan passed Dukes, moved into his lane, and promptly slowed to a speed somewhere between 60 and 65 mph. Another car then sped past Dukes and the sedan and moved into the fast lane in order to get around them and the semitrailer. At this point, Dukes’ truck was uncomfortably close to the sedan’s rear bumper. He moved into the slow lane, sped up considerably, and merged back into the fast lane, but by then, the gap between the sedan and the semi had narrowed, forcing the driver of the car to swerve completely off the highway and onto the left shoulder to avoid a collision. It all happened within a five-second time frame. There was no impact, and the sedan’s driver maintained control of the vehicle. In fact, he followed Dukes until they exited on Spring Street in Paso Robles. That’s where the sedan flipped on its hidden sirens and flashing lights. Imagine Dukes’ surprise. The driver who had cut him off, whom Dukes nearly hit moments later, was an undercover SLO sheriff’s deputy. Dukes admitted to having an illegally concealed, loaded firearm in the vehicle, and the deputy took him to jail. Due to the danger of his assignment, the deputy won’t be named in this article, but he testified on the stand in his dual role as the alleged crime’s victim and arresting officer. He said Dukes used expletives when detained and was noticeably upset about the situation. He also said that Dukes’ actions put him in imminent danger. Under cross-examination from Dukes’ defense attorney, Lou Koory, the deputy said he didn’t recall speeding up to close the gap between himself and the semitrailer and that he didn’t see Dukes’ turn signal but couldn’t say for sure whether or not it was used. He admitted that he could have yielded to the defendant, but said that Dukes’ driving confused him, because there was no room to pass. He also noted that his incident report made no mention of the semitrailer or the traffic maneuver that would allow him and his partner to trade places. According to California Vehicle Code 13351.5, anyone convicted of using his or her vehicle as a tool for felony deadly assault immediately loses driving privileges, not to be reinstated under any circumstances. However, assault with a deadly weapon can be charged as either a felony or a misdemeanor at the discretion of the court and prosecutors. Koory asked retired judge Hugh Mullin III, who heard the case on assignment from the judicial council, to consider reducing the assault charge to a misdemeanor since there’s no evidence relating to Dukes’ intent or whether the assault would likely have resulted in deadly or great bodily harm. The judge declined, noting that the deputy’s testimony is the only evidence available, and he felt significantly threatened. There’s no dispute over the misdemeanor charges stemming from Dukes’ concealed, loaded weapon. Dukes has yet to take the stand and declined a request for comment. He’s due back in court April 16 for a pretrial hearing.